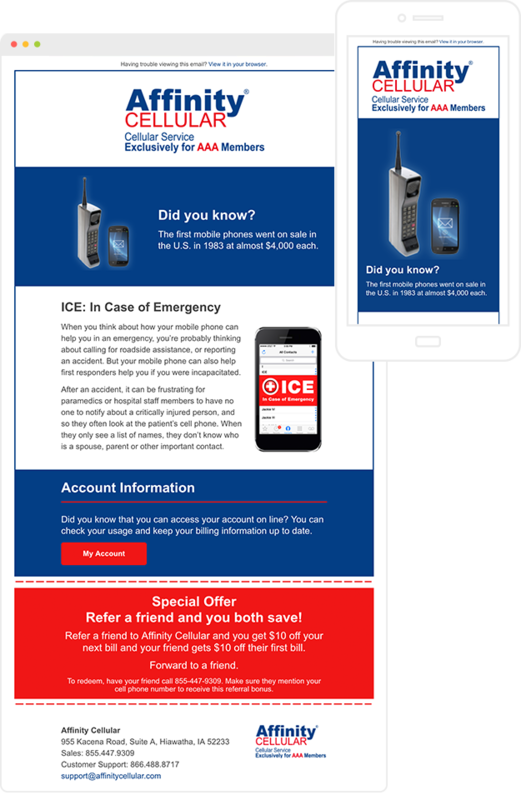 Affinity Cellular provides cell phones and cell phone service plans to AAA members. They were looking for a way to stay in touch with current clients by sharing informational articles, tips and offers. Mail on the Mark generates the ideas, writes the text and creates custom graphics for each newsletter. We then format and send it out on-time and provide reporting on opens and clicks. We make it easy! We just get it done. Writing, graphics, sending and follow-up, the client turns it over to us and we make it happen. We review and share stats on each newsletter so we can continually improve.